A violin made from one of Winston Churchill’s cigar boxes was one of the starring lots at Ingles & Hayday October 25 auction. Bidding took off at the I&H sale and the violin finally sold at £5500 to a determined Irishman in the rooms – Gerry O’Brien, well known to the community of dealers in Kensington Church Street as the landlord of their watering hole The Churchill Arms (and in this writer’s opinion one of the best pubs in London). The 1956 instrument was made by William Robinson (1880-1960) of Plumstead, a former master saddler who turned his childhood hobby into a business and made more than 400 such cigar box instruments over his lifetime. This instrument was rather special with a 12½in (32cm) long box lid, branded Made in Havana, Cuba and Selección Privada, Fabrica Tabacos Don Joaquin, Habana, and a label reading Sir Winston Churchill. As well as a large butterfly collection, dozens of chamber pots hanging from the ceiling and mementoes of his home hurling team, Co Clare, O’Brien has built up a remarkable personal collection of Churchilliana on display at the pub which he has run since 1988. He is having a glass case made to protect the instrument which will hang above the bar but will be taken down and played by a professional musician and Churchill regular at the annual and remarkable celebrations of the great man’s November 30 birthday. The instrument was made after Clarissa Eden, the then UK Prime Minister’s wife, was a fan of Robinson and had secured the box for him in 1956. Nor was the rustic violin without merit – Sir Yehudi Menuhin played it in a US radio broadcast in 1958. Owned by the same family since it was made, it was estimated at £500-1000 at I&H, the firm set up by Tim Ingles and Paul Hayday, former experts at Sotheby’s whose association with the London house extends to holding their biannual sales at the New Bond Street rooms. 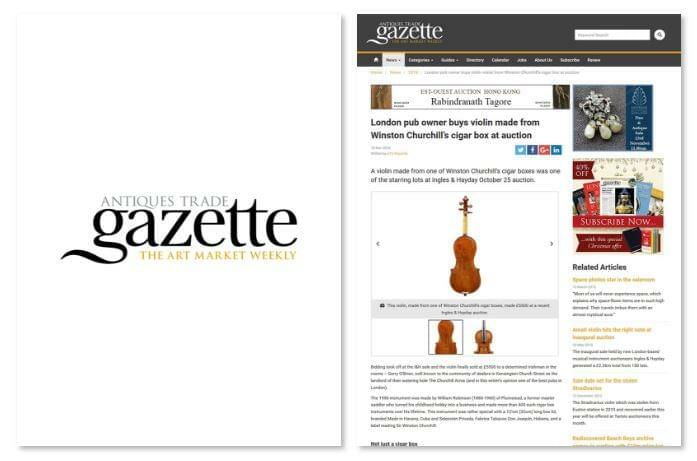 With eight world record prices for violins and three more for violas pushing the hammer total to £2.25m, there was much for musicians and instruments experts to mull over after the I&H (20% buyer’s premium) sale. Back in the big-money world, the day was led by a violin bearing the original label Thomas Balestrieri Cremonensis Fecit Mantuæ. Anno 1788 which went above estimate to a private UK collector at £250,000. However, for director Tim Ingles, the day’s highlight was a 1798 violin by Ferdinando Gagliano (fl.Naples, c.1770-95). “It was almost perfectly preserved,” said Ingles. “It has been in the possession of the same family for over 200 years and has survived in remarkably pure condition. Its original varnish has not been retouched or polished, and the violin has never been opened for restoration. Estimated at £65,000-80,000, it sold at £150,000.